Put Autogeek.net on your Google Toolbar! The Google Toolbar allows you to put links to your favorite websites right at the top of your internet browser. No matter where you are on the web, Autogeek.net is just a click away. Autogeek’s Google Toolbar button works with Internet Explorer and Mozilla Firefox. Simply download and install Google Toolbar for your browser by clicking on “Get Google Toolbar” below. It’s free and easy to install. 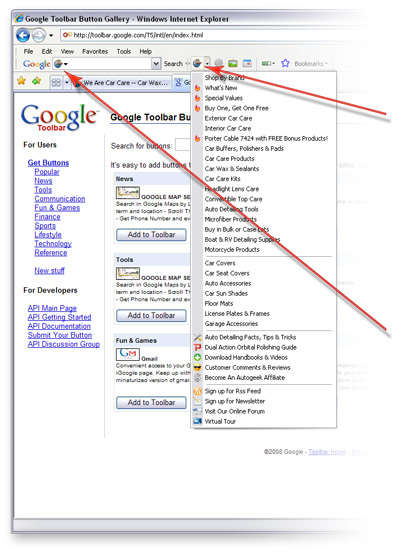 Then click on “Add to Google Toolbar” to add an Autogeek button to your toolbar. Click directly on the Autogeek icon to come to our home page. Click on the arrow to select a specific section of the website. If you’re looking for something in particular, select Autogeek from the drop-down menu in the Google Toolbar search box. Our button will appear in the search box and you can then enter a keyword or item. Hit enter and you’ll immediately be directed to a list of pages matching your query within Autogeek. The Autogeek.net button for your Google Toolbar is just another way we’re making it easy to find everything you need to make your vehicle shine. The Autogeek.net button, links directly to our website and any of our primary product categories. New features of the Google™ Toolbar allow you to highlight any text on any website including Autogeek.net and just click the The Autogeek.net button in the Google™ Toolbar to search for that highlighted text in our product database!